Technology Instructions for Lyet 150, 151, 152, 153, 249, 250, 251, 252, and 253. If you experience any problems, call ext. 3333 or e-mail the Help Desk at mediaservices@etown.edu. Please visit our Web site at http://www.etown.edu/ITS for additional information. Step 1:Push down the front of the Crestron Station’s lid to open the Crestron Control Panel. Step 2:Press anywhere on the Control Panel to activate the touch screen.Step 3:Press SOURCE in the middle of the touch screen.Step 4:Press PC on the touch screen or on the right-hand side buttons, and the projector will automatically turn on. Note: Wait a few moments for the projector to warm up. Step 5:Press the power buttons located on the front of the computer and monitor if not already turned on. Log on with your network username and password. (If you are a guest, please contact the department assistant for a username and password. )Step 6:The computer image will appear on the projection screen. 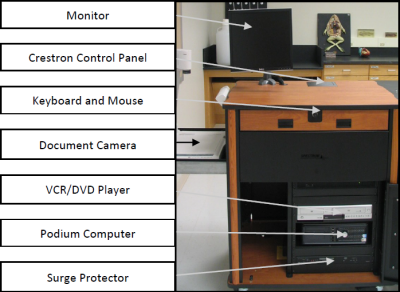 Step 2:Press anywhere on the Control Panel to activate the touch screen.Step 3:Press SOURCE in the middle of the touch screen.Step 4:Press DOC CAM and the projector will automatically turn on. Step 5:Pull the Document Camera out of the podium by pulling out the left-hand side drawer of the podium.Step 6:Raise the camera arm using the release at the bottom of the arm. Lift the side arms. The power switch is on the left-hand side. The panel lights will turn green when turned on. Step 7:Use the detail, focus and zoom buttons on the Document Camera to adjust the view of your objects. Warning: You must register your laptop to use it on the college network. Step 1:Begin with the laptop turned OFF in order to connect.Step 2:Push down the front of the Crestron Station’s lid to open the Control Panel. Step 3:Connect the VGA cable to the blue port and the sound cable to the headphone jack on your laptop. The cables are found in the Control station.Step 4:There is NO Ethernet cable to connect a laptop to the network; you must connect to the Internet wirelessly. Contact the Help Desk with any questions. If you are a guest, you may need to request the username and password.Step 5:Press anywhere on the Control Panel to activate the touch screen.Step 6:Press SOURCE in the middle of the touch screen.Step 7:Press LAPTOP on the touch screen or on the right-hand side buttons, and the projector will automatically turn on. Step 8:Turn on the laptop. If you need power, plug your power adapter into the electrical outlet inside of the control station.Step 9:Press the appropriate keyboard combination to display the laptop image on the projection screen. Note: All laptops have different settings that allow the two screens to match. See the image below. Step 1:Press the POWER button on the silver VCR/DVD player if not already turned on.Step 2:Push down the front of the Crestron Station’s lid to open the Crestron Control Panel. Step 3:Press anywhere on the Control Panel to activate the touch screen.Step 4:Press SOURCE in the middle of the touch screen.Step 5:Press DVD or VCR on the touch screen or on the side buttons, and the projector will automatically turn on. Step 6:Place either a DVD in the left or a VHS tape in the right side of the Player.Step 7:Use the Crestron Panel buttons in order to control the VCR/DVD Player. Step 1:Turn the computer off by clicking the START button at the bottom left of the screen, then select the SHUTDOWN option. 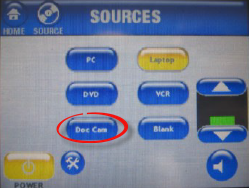 Choose SHUTDOWN in the dialog box and click OK.Step 2:Turn off the projector by pushing the yellow POWER button at the bottom-left corner of the Crestron Control panel. 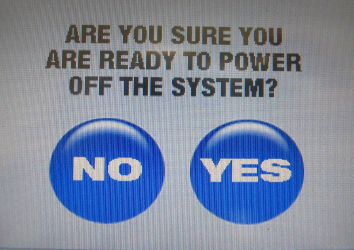 It will prompt you, “Are you sure you are ready to power off the system?” Push YES. Step 3:If you want to turn on the projector again, wait several minutes for the machine to cool down before restarting the projector.Step 4:Make sure that you leave everything as you found it for the next individual to use the podium and the media equipment.